Click banner for more stops! Seventeen-year-old Majesty Alistair wants police to look further into her father’s fatal car wreck, hopes the baseball team she manages can reclaim the state crown, aches for Derek…or, no…maybe Alec…maybe. And she mostly wishes to retract the hateful words she said to her dad right before slamming the door in his face, only to never see him again. All her desires get sidelined, though, when she overhears two fellow students planning a church massacre. She doubts cops will follow up on her tip since they’re sick of her coming around with notions of possible crimes-in-the-works. And it’s not like she cries wolf. Not really. They’d be freaked too, but they’re not the ones suffering from bloody dreams that hint at disaster like some crazy, street guy forecasting the Apocalypse. So, she does what any habitual winner with zero cred would do…try to I.D. the nutjobs before they act. But, when their agenda turns out to be far bigger than she ever assumed, and even friends start looking suspect, the truth and her actions threaten to haunt her forever, especially since she’s left with blood on her hands, the blood of someone she loves. Majesty, spunky and defiant, stumbles upon a disastrous church massacre plot and will do anything to intervene before innocent people are killed. The scenes are so believable that I can already picture some of them coming to life. The story has a complex plot, but once you start reading it’ll be hard to put down! Vail’s writing is as different as a prince to a lowly peasant. She has a way of making the characters seem so genuine by their actions, decisions and even the slang they speak. Everyone used the same kind of language, but when jumping from multiple perspectives throughout the story without a set pattern, I noticed how each character sounded distinctly different. Even with such strong individuals, it took Majesty’s super sleuth powers to dig deep as the ocean for the truth. The characters’ distinct voices didn’t eliminate guilt from suspects until everything was said and done. The unidentified suspect could have absolutely been anyone, and I’ll admit that I suspected characters that were completely innocent. There’s so much manipulation through the pages of Kings and Queens that even I was fooled! Not being able to unravel the web of truths and untruths until the very end made this a fun and addictive novel. I really appreciated Vail’s ability to incorporate every character introduced in the story, whether they played a very minor part or were major players. She didn’t introduce excess characters even though there were quite a few. 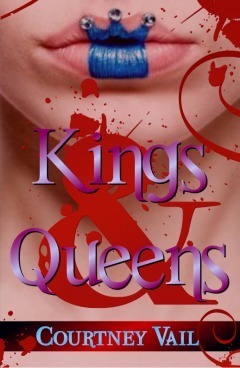 Courtney Vail thrills and shocks in her debut YA mystery, Kings and Queens. I really enjoyed reading this mystery because it reminded me of one of my favorite detective TV shows, Veronica Mars. The authentic high school drama and conspiracies were warped and utterly original. Thanks for the sweet review. I'm glad you enjoyed the book.